February is our last official Summer month with warm weather and less crowds than December and January. It's a great month to sneak in outside of school holidays and enjoy all that the Gold Coast has to offer. Find out everything you need to know about visiting the Gold Coast at this time of the year. February is our last month of Summer on the Gold Coast! And the beach is central to life and holidays. You can see Aussie icons battling it out in surf carnivals and surfing competitions. Or simply enjoy a bit of beach - and we have rather alot to choose from with beaches on the Gold Coast stretching from Coolangatta in the south right up to Main Beach and the The Spit. Gold Coast in February is a great time to be by the beach, surf or a pool since it the weather in february is still hot and humid! February is not as hectic as January. It is still very much summer time, but most school children have headed back to school after their long summer break. University students don't head back till the end of the month and can be seen mouching around the Gold Coast enjoying their extended break. Gold Coasters enjoy getting out and about on the weekends during this warm summer month. You will find beaches and theme parks are busier on the weekends than during the week. On the weekends the Broadwater is a buzz with boats, houseboats and jet skis at this time of the year. It is great to get out on the water on a sunny day. It is also a very sporting month in the Gold Coast. Apart from surf lifesaving and surf carnivals - there are often major golf competitions. Sport and Aussies go together - so this is a great time to see some Aussie Icons. Sport isn't the only thing you can do in the Gold Coast during February. It's a brilliant time to check out the rainforest in the hinterland. The lush rainforest comes alive with interesting plants and animals and is a complete contrast to the hustle and bustle of the built up coast - it's also a little cooler too! Read on to find out more about visiting the Gold Coast during February. All the information below is updated each year to keep it current. I recommend, if you haven't already, that you get a copy of my planning cheat sheets. Use the information on this page to fill them in, to help plan your holiday. In the table below are averages for various weather indicators for Gold Coast in February. Click here for current weather information in Gold Coast. Hot, humid, rainy season, tropical storms generally in late afternoon early evening. Expect rain with an average 14 rainy days per month and with 13% of annual rainfall during this month. Rain generally falls during the summer storms which include thunder, lightning and form during the late afternoon. Bring an umbrella or rain jacket, however, you are unlikely to be cold! You can still enjoy the Gold Coast and theme parks on most days when it is raining. Check out my rainy day tips. What's On In The Gold Coast In February? More events and dates for February events on Gold Coast. This is a great time to sneak in a late summer holiday when Queensland school children have returned to school! You will still need to book early for good family accommodation particularly around the southern end of the coast due to the various surf carnivals. Accommodation with air-conditioning is highly recommended at this time of year. It is often hot and sticky and temperatures at night often don't drop too low. Pack rain mac or umbrella and be prepared for showers at times. It is still very hot and humid this month. Most Australian school kids are back at school during this month. It is quieter but definitely not quiet! If you want to witness some iconic Australian sports, this is a great month to visit. Good quality, air-conditioned accommodation in a good location is still the best pick. Most surf carnivals will be mid to southern end of the coast. 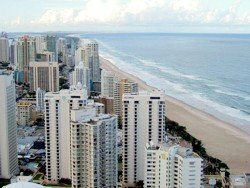 If you plan to be mostly watching surf carnivals then opt for accommodation in or south of Surfers Paradise. Pack clothes for hot humid weather and I highly recommend a rain mac and umbrella for those showers that are likely during this month. At this time of the year most of our overseas visitors are coming from winter to our summer so it is unlikely you will feel cold! If you plan to head to our rainforest you may find it a little cooler so bring a light jacket or jumper just in case. Your Questions About Gold Coast in February? Do You Have A Question About February In The Gold Coast.? Ask a specific question about February in the Gold Coast, Queensland or Australia is and I will try my best to point you in the right direction.